As a young girl, I’ve never been a crust person. Yet with age I guess I’ve matured from my picky-eater days. 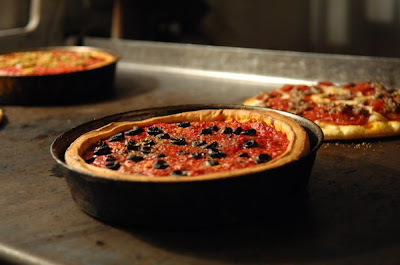 One Friday after school, I rendezvoused with my parents in Hayes Valley and enjoyed a rare early dinner at Patxi’s Chicago Pizza. With the first bite of my deep dish slice, my taste buds thanked me for reconsidering. According to the take-out box, the restaurant’s title is pronounced “pah-cheese,” but the locals know that by now. Nestled in the 2-block radius of Hayes Valley, the pizzeria constantly overflows with families with kids, buddies up for a slice and a beer, or couples on a casual date. 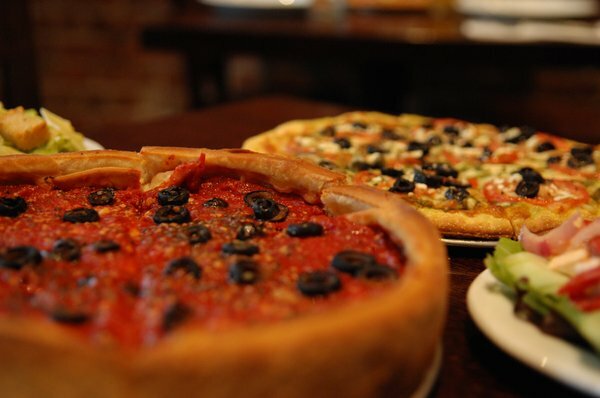 However, with pizza orders requiring twenty minutes for thin crust and nearly forty for their signature deep dish creations, coming here for dinner may be a bit time consuming — they even recommend calling the order in before showing up. Luckily for the three of us, we had gotten there before six o’clock, clearly noting that the ten young, friendly wait staff would definitely be needed later that evening. The menu offered salads at a welcoming $5.95, so we settled for a Greek. As for the pizza, we chose a 14” pan-style filled with sun dried tomatoes, mushrooms and Italian sausage ($28). The salad arrived fit to feed one, but we all thoroughly enjoyed the garden-fresh bell pepper, cucumber, red onion, Kalamata olive, feta cheese and red wine vinaigrette mix, which surprisingly featured almost no leafy greens. Afterwards my mom and I took a walk around the block to cater to our impatience, yet we came back to find our waiter at our table, leaving with a “Cheers” and a steaming, crimson pie before us. With one look at the seeping slice oozing on my plate, I knew that this pizza required a knife and fork. The first bite sizzled in my mouth. I closed my eyes and relished the tanginess of the homemade sauce (unfortunately, the taste of the sun dried tomato couldn’t compete on my palate), the stretch of creamy mozzarella and the chewiness of the herb seasoned Italian sausage. As I continued to slice away, I realized that what made this pizza so filling was the cheese, though the tomato exterior of the Chicago style pie didn’t suggest it. Though the deep dish slice was much too heavy to lift, the crust supported its exemplary taste nonetheless. The bottom layer was sprinkled in cornmeal and crisped to a golden brown. The next layer was almost buttery and flaky in composition while the uppermost layer blended beautifully with the filling. For a moment there a bite of crust reminded me of eating a forkful of creamy homemade chicken pot pie. Mmmm. By my second slice, though my stomach was nearing its capacity, I troughed through the slice to get to my favorite part, where the filling meets the crust. This was another story. I examined my rod of crust and bit into it. The texture reminded me of a Mexican churro, crispy on the outside and soft, fluffy and warm within. My taste buds reported that this was definitely one of the most pleasant crusts I’ve ever pondered over. Finally, my mom, dad and I pulled back our chairs and stretched out our stomachs. “Could you imagine finishing that whole pie on your own?” my dad ventured, glancing at the remaining two slices we saved for my brother. “That would be disrespectful,” I replied. I guess we dined mischievously that night. We hit the road early to reach Hilo, the second biggest city in all the islands, by noon. First we stopped at Waimea, which was in paniolo, or cowboy, country. Some say that this region is the Northern California of the Big Island-- as in, it looks like the land and roads up in Napa Valley. We stopped in a busy spot in town, a "dive" called Hawaiian Style Cafe. We sat there intrigued by the menu, which offered countless variations of loco moco, which is basically meat and rice smothered in gravy. Didn't sound too great nine o'clock in the morning. We looked around to see what other people were ordering; as if on cue, the couple next to us had just received their side order of pancakes. These things were at least 6 inches in diameter, with two stacked on top of each other and a dollop of butter spread on top. So the food here is a heart attack on a plate, super-sized. Gaping at their food, my mom and I were actually hoping that they'd give us their extra plate of pancakes! Instead, the man asked for a to-go box. His beau asked him, "You're eating those?" and he replied as he shoved the cakes in (they wouldn't fit without being squished) "Yeah, tomorrow!" The entire counter laughed. Anyway, long story short, there really wasn't any point of them piling food onto one plate because in truth, it wasn't any good. I was amazed my brother finished his Da Tita Mok, which was basically your four types of meat, fried, on scrambled eggs and rice smothered in gravy. Ew. And yet he's still as skinny as a stick. Once out of Waimea, the drive to Hilo is 45 minutes and passes through the beautiful Hamakua Coast, known for its lush vegetation and flowing waterfalls. 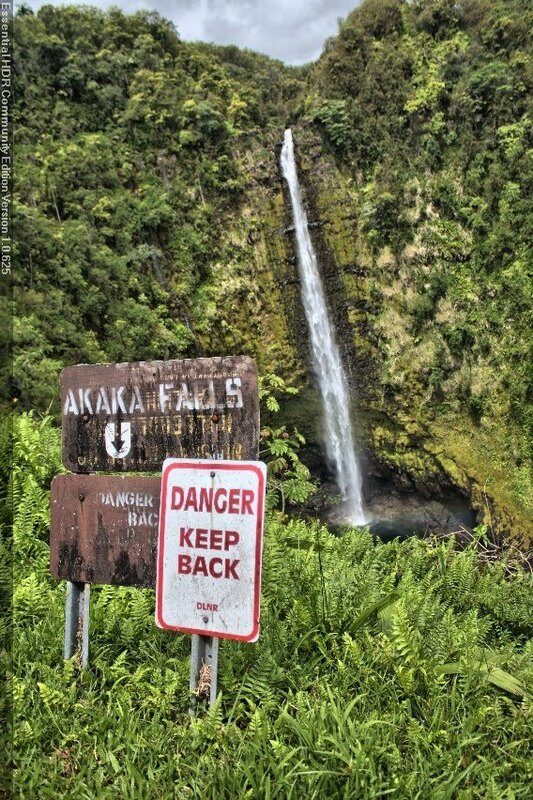 While a few pour right off the coastal cliffs and into the ocea n, they can only be seen in the air; we opted for the more accessible 'Akaka Falls 10 miles from Hilo instead. These majestic falls are only a mile from downtown Hilo-- what a spot! When my Pop mentioned beforehand that he wanted to ride in a helicopter to the crater of a volcano, I thought, No way. Yet on our fourth day here, I found myself in the best seat of a 7-passenger helicopter, video camera at hand. Well, my Pop insisted, and it was decided that my brother and I should experience this once-in-a-lifetime opportunity. So we took off from Hilo airport and already were given a birds-eye view of the city and its waterfalls. It was quite a sight. But that's not what we were here for. We whizzed in the sky, just beneath the clouds, for maybe 5-10 minutes before we saw the steaming Kilauea in the distance. Our pilot, Ray, was quite the cheeseball with his bad jokes, but he was chipper and taught us a few things. When we were parallel the Pu'u O'o Crater, the heart of the current eruption, we didn't exactly see waves of lava crashing, but freshly cooled lava instead. Still a great view. It took us a few more circles around the crater until we finally saw a glint of red. Then we continued down the some 20-mile long expansion of cooled lava and saw trees and shrub sprouting from the black mess. In some places an oasis of sorts popped up, an island of trees in a sea of black ripples and rubble. We even saw the "Road to Nowhere," where a vacation house was rebuilt and remains on a useless, lava-covered strip of asphalt. The home's inhabitants has to enter their retreat by helicopter. The only thing I can come up with is, "Why?" Then, there, we finally spotted lava streaming down from a random spot. Boy, it was moving remarkably fast. But when we returned to the same spot two or three minutes later, the lava flow was nearly gone. Lava is ever-changing, I guess. After fifty minutes in the sky, we turned around to get back to Hilo. I can't say if the sights we had seen were what I expected, but I enjoyed my first helicopter ride nonetheless. After we landed, I asked Ray if he conducts tours when there really isn't any lava flowing (I mean, our trip was a near miss) and he replied with, "Well, lava can change at anytime. You go out there and see some waterfalls and who knows, six hours later you see a river of red." I don't know what's that supposed to mean, but I'll take it. Back on solid ground, we whizzed out of the airport and went to Mau- na Lao Macadamia Nut Factory, which I had just seen from a birds-eye view before we landed. The drive off the highway leads you on a long road surrounded by 25,000 macadamia trees. We pulled up to the visitor center excited for samples. My personal favorite was the coconut-chocolate covered nut. Yum. When we walked over to the processing factory, however, we were disappointed-- we chose King Kamehameha holiday to visit, and they had shut down for the day. Darn! I would have loved to see them chocolate-coat those delicious macadamias. (FYI, I grew up hating nuts, but thanks to the smooth creaminess of the macadamia, I'm starting to come around). My brother and I wanted to get our swim in for the day (hey, it's important to take advantage of Hawaii's cool, clean, refreshing water! ), so my parents and Nana led us to Coconut Island, a spot they found while w aiting for us back in downtown Hilo. They had a surprise for us, they said. When my mom showed me pictures she had taken earlier on her camera, my brother and I new what we were in for. As the sun set, we hopped back in the van to make our three-hour drive home. We drove back the way we came, and were greeted with ferocious rains. Once we hit Waimea, we stopped once again for dinner. Somebo dy suggested Hawaiian Style Cafe, and we immediately agreed "NO!" Thanks to our The Big Island Revealed guidebook, we found Huli Sue's, a barbecue joint with a quaint, homey feel. The ribs and brisket were definitely recommended, so we ordered two sampler plates with our choice of sides. My mom and I chose local veggies and corn pudding, which was only served at dinner. I'm not sure what exactly corn pudding is, but it was tasty. The ribs fell off the bone and the brisket was tender. Oh, yeah. Our meat was smothered with Chipotle sauce while my dad and brother shared a plate drowned in a tangier plum hot sauce. And we must admit, their sauce was better! Afterward, we eyed their dessert menu and was flabbergasted by the price of their pie-- one banana creme pie was $58! Well, our book said it's possibly the best on the island and we figured it must be killer if it were so pricey, so...we ordered two slices. The slices were topped in a layer of delicate meringue, along with sliced bananas and an excellent graham cracker crust. What was really great about it is that they didn't poison the pie with loads of added sugar. As my mother would say, "It's not even sweet!" (Though she's often wrong. I love you, Mom!). Just by looking out the rental car window, one can marvel at the diverse landscapes on any side of the island. Why is that? Well, there are 13 microclimates on this planet, and the Big Island happens to host 11 of them. That's 11 comp letely diverse ecosystems, making this island any visitor's science lesson. Today my family ventured out on Palani Rd and drove for about 7 miles up the mountain, despite the "No Outlet" sign. We knew that we were driving straight into a foggy haze. As our van crept higher and higher, we noticed the lush vegetation (mango trees at first, but then mostly fern). As a matter of fact, there were some precious estates tucked up here. The air felt great: the fog was refreshing and it was like stepping out of a shower (not like any San Francisco fog blast). Pretty soon we couldn't see in front of us. We also noticed some birds frolicking on the side of the road; according to our guidebook, they were renegade peacocks. So, we finally reached a dead end. The funny thing is that we were all afraid to get out of the car: the hill was so steep and we were worried that the emergency brake would let us down! But anyway, we crept out. On a good day, we might have spotted some views of volcanoes. But not today. So we stayed up there, took pictures, enjoyed yet another diverse ecosystem of the island and headed back down. (Might I add that my mom refused to sit in the car as my dad declined down the hill-- we walked halfway down!). We got back on the road and drove north, toward Waimea. However, we didn't end up going there (don't ask me why-- navigation troubles, perhaps?) and drove 30 miles across a desert scene. Lava that had spewed in the 1800's remained, of course, and the land was dry and mostly black. So you can imagine that the drive was uneventful. Once we entered ‘Anaeho’omalu Bay 45 minutes later, all was forgiven. This bay, known simply as A Bay, was a pristine spot for windsurfing, parasailing and snorkeling. We were here for the latter. However, the water looked rough and uninviting, and the strong ocean breeze actually made me feel, well, too cold to jump right in. Yet a few minutes later, we spotted two light green discs washing up onto the shore. Once they poked their heads out of the water, we finally realized that they were green sea turtles, just a couple feet away from us! That convinced me. I slid on the flippers and swam right in there. And I did actually see more sea turtles! Even with a snorkel (which allows you to breathe underwater), the sight was breathtaking. I was swimming right next to an incredibly special animal. And if I thought one sea cucumber and three fish was exciting, boy, oh boy—there were at least seven different types of fish alone, with sea urchin and sea anemone hitched onto the coral reef. I was enjoying myself immensely, and the only panic I felt was having to surface and tread water. At one point, if I had simply floated unmoving, the strong current would have pushed me right into the feeding, oblivious sea turtle! Also, I was so afraid of touching the living coral with my flippers, damaging Mother Nature’s tedious and remarkable work. Why would anyone enter such a profound store like this? Well, turns out that these balls are seriously ono, or delicious. Yup, with at least ten varieties, these chocolate covered macadamia nuts are famous on the Big Island . We stepped in and were offered a free sample of these bodacious nuts, dipped 50 times in chocolate, and licked our fingers afterward. They were good! And expensive. At $11 for four ping pong-sized candies, we decided we had to sneak out without buying anything. But we enjoyed reading all the different donkey ball delicacies, such as Spiky Balls (with pineapple), Dirty Balls (rolled in cocoa powder), and Balls of Fire (rolled in some kind of spice). 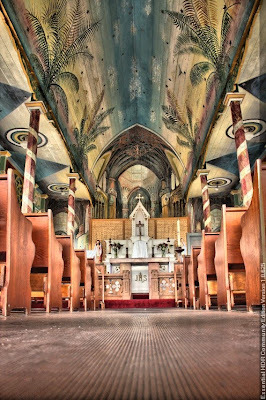 Heading south, we turned off the highway to visit the Painted Church, also known as the St. Benedict’s Catholic Church. 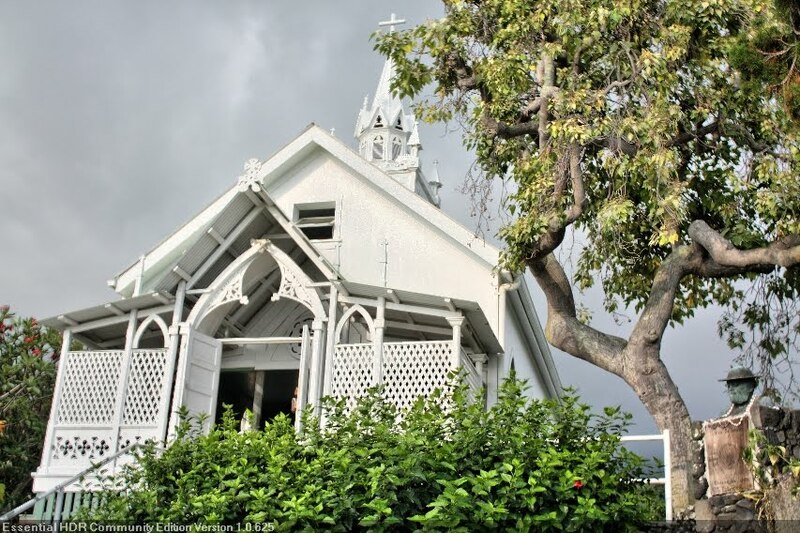 The view of Kealakeku a Bay is amazing and the church grounds are quaint. The doors to the chapel, built in 1842, are wide open. 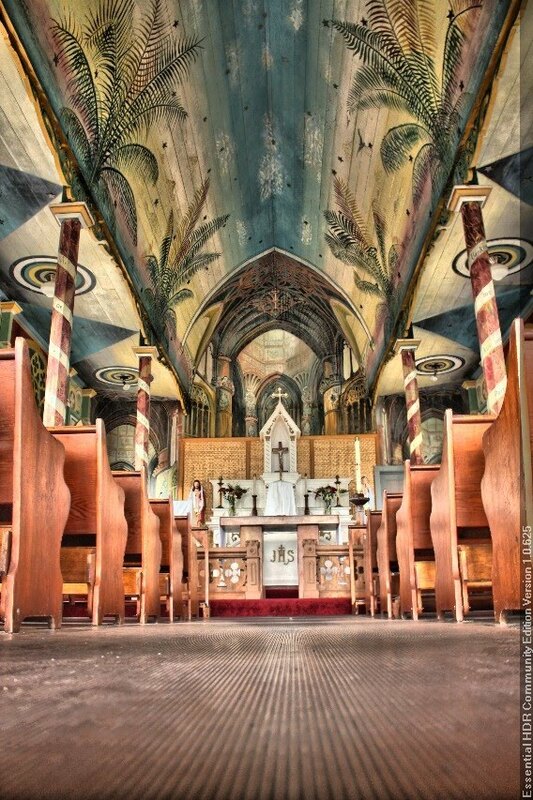 Inside, religious scenes adorn the walls and ceilings, painted by one devoted Father John Velge more than 150 years ago. Mass services are still held here each Sunday, and quite frankly, it seems likes churchgoers are in for a treat coming here. It’s definitely a great place to peak in, regardless of your beliefs. After leaving this sanctuary, I wondered out loud, “If I became a park ranger, could I choose this park to work in?” because of its serenity and awe. Back in the 16th century, when the strict kapu system forbid the upper and lower social classes from even crossing shadows, violators faced one dreary death sentence. Oftentimes, if the offense was severe enough, an entire family could be wiped out by club, strangulation, fire or spear. Yet the gods gave everyone one chance of escaping such a cruel practice: if the lawbreakers could make it to predesignated sites known as Places of Refuge, then all was forgiven and they could move on with their lives. 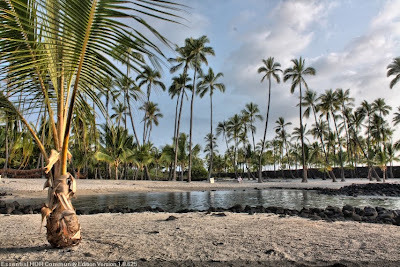 Here at Pu’uhonua o Honaunau, where the coconut t rees reflect on the calm waters and lava-made tide pools scatter the shore, it doesn’t sound like a bad tradeoff at all! I found this place significantly serene and calming, and with my guidebook in tow, I was transported to a sacred site where once fear-stricken people lived free of worry; where palm huts, carved wooden idols and an impressive Great Wall still stand today. I felt fortunate that the National Park Service posted signs claiming that this was a sacred site, therefore banning any swimming, snorkeling or sunbathing. This site was too special for that. We started our day not with your average cup of joe, but with 100% Kona coffee. We received a free private tour of Greenwell Farms, around ten miles south of Kona, and in ten minutes we were coffee experts. 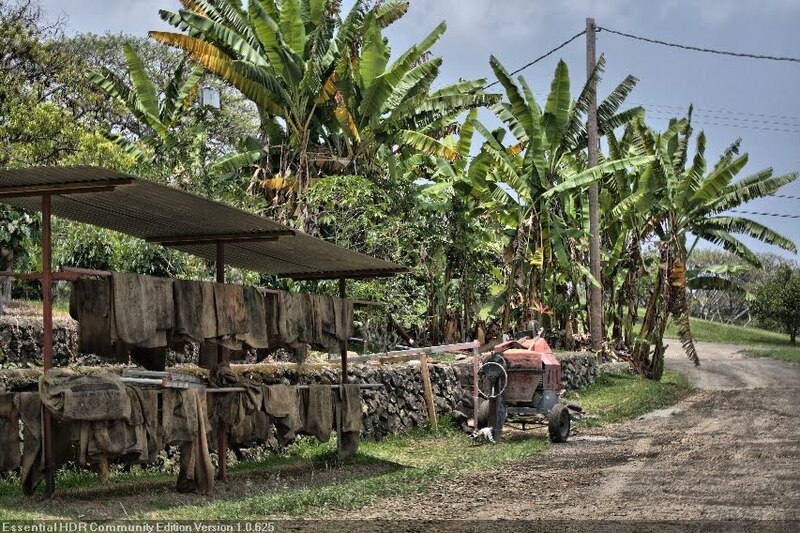 Greenwell Farms is the oldest farm on the islands and the first to export Kona coffee beans. For us Californians, whenever you see Kona coffee blends in a Peet's or Starbucks, you can guarantee it came from Greenwell Farms. So what makes Kona coffee so damn special? Well, in order to qualify as Kona coffee, it must be grown in a 22-mile coffee belt that spans the perfect median of climate and elevation on the Big Island. So don't be fooled-- check if your coffee is truly 100% authentic-- because this stuff ain't cheap. We continued south and head makai, or toward the sea. Down a winding road we arrived at Kealakekua Bay, noted to be one of the most beautiful on the island. The bay is especially famous for Captain Cook Monument, a white obelisk seen across the water one mile away. The statue commemorates Captain James Cook, who was the first white European to land on the Hawaiian islands. Not only does the spot mark historical interest, but the best snorkeling and spinner dolphin viewing is seen there. However, we didn't jump right in-- the only options to getting there is by kayak, a dangerous cliff climb, or by boat (which we'll be doing a few days from now). In fact, we hurried to book our boating excursion because word has it that the bay may become off-limits to humans. Protection groups have fought to stop tourists from entering the bay; believe it or not, but over the years, sunblock residue has formed a film across the surface, blocking needed light for the marine life. So this may be our only chance to experience the nature of the bay up-close. Heading back to town, my Nana marveled at my mom, brother and I as we constantly pointed out the mango trees that grew along the road, just waiting to be picked. You see, my dearest Filipino mother has a deep nostalgia for fresh mango, and she came to Hawai'i knowing that mango grows abundantly here. Yet we were tortured driving to Kona because my dad refused to stop to pick mango from people's property. But oh, we can't really even ventured onto state land because apparently, mango-picking is a misdemeanor that could land you a $250 fine and a night in prison. But my mom says she doesn't mind. My brother and I are on her side as well. It's an interesting topic that may spring up in future job interviews! Instead, we opted for buying three mangoes at the Coconut Grove Farmers' Market at Kona. Not worth the price when mangoes are hanging over the highway, but at least it's legal. Aside from that, the rest of the market features a lot of handcrafted souvenoirs. We came here knowing that this sweet spot serves a mean cinnamon roll and coffee, but we decided to try their lunch fare first. Boy, was it good! I split fresh mahi mahi tacos with a great salad and black beans with my mom and everything tasted superb. And filling enough. My Nana ordered a veggie hummus wrap, my Pop a huge, delightful turkey sandwich served with salad, and my brother a roast beef sandwich with au jus. At least I think he ordered that because man, he wolfed that thing down! Must of been good. My Dad went safe with an unimpressive Ceasar salad knowing that he'd eat our leftovers. Eventually my Pop did order some java and a Pull-Apart cinnamon roll, served warm. It was heaven. And having that first thing in the morning? Not a bad treat! We briskly finished lunch determined to reach Hapuna Beach forty minutes up north. My Nana had requested a white sand beach to unwind on even the minute we bought plane tickets, so we were on a mission to get her there. Hapuna Beach is often ranked by travel shows as one of the top ten beaches in the U.S., next to some sandy shore in Florida. And it sure didn't disappoint. My brother, Dad and I practiced our snorkeling for the first time in the comfortably warm waters. We spent an hour and a half in there, as we were easily wowed by one sea cucumber and a couple of fish. Ha, if we thought that was exciting, we had no idea what was in store for us the next day! E komo mai! Yes, here I am-- a malihini, or a newcomer to the islands of Hawai'i. 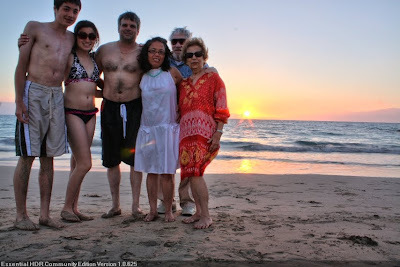 My family of six, grandparents included, pioneered over to the Big Island for a week to celebrate my Nana's eightieth. At first I held prejudice against the Big Island because Honolulu, the capital, Pearl Harbor, the Dole pineapple plantation, Wakiki etc. etc. aren't located here. When I realized this I asked my dad, "If we aren't going to Oah'u, we're everything's at, then why are we even going to Hawai'i?" Well, after being here for two days, I'm convinced that we made the right decision. 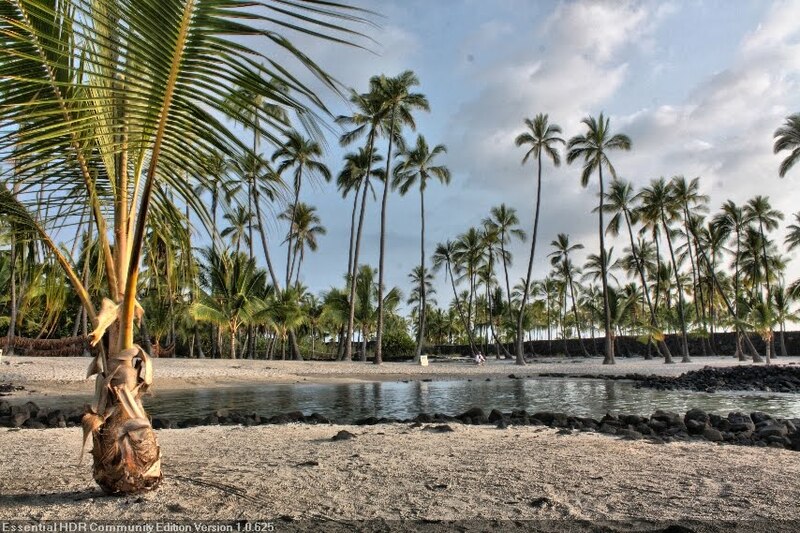 The Big Island is much less commercial and tourist-y, features Hawai'i Volcanoes National Park, the Kona coffee belt, plus a wide array of ecosystems from one side of the island to the other. As the concierge at our condo said, landing in Kona airport is like landing on the moon. The landscape doesn't look like the tropical island you'd expect: the land has craters, rough, black and unappealing. Turns out that that's hardened lava, stretched across the land as far as the eye can see. While driving from the airport, the black landscape is suddenly disturbed by blazing white patches of coral. However, this coral doesn't form on the black backdrop naturally. Known as coral graffiti, people collect coral from the sea and form messages on the side of the road. It's a local tradition that's pretty nifty, and my family even noted that there's no profanity ("Where's the big f-word, huh?"). We arrived in Kona at 11 am, which was pleasant-- we were three hours younger than in San Francisco! We drove for thirty minutes north to the district of South Kaholo. Along the way, we finally saw some palm trees and beaches, though they looked like an oasis (so close, yet so far away) since they were a couple miles off of Queen Ka'ahumanu Hwy. Led by our guidebook, we stopped at a high-end resort that included Queen's Marketplace, a quaint outdoor mall with Merriman's Market Cafe. This restaurant offered Mediterranean fare for respectable prices. Seated outside with an ocean breeze and a friendly waitress, dendrobium orchid tucked behind her ear, we instantly felt transported to, well, Hawai'i. The waitress convinced us to order two bruschetta, which was sweet, flavorful and on the best bread. The salads we ordered featured local greens and zesty dressings. We were impressed by their use of local ingredients, such as arugula and the Hawaiian tomato, which is special in its own way but can't compete with California heirlooms. However, the only thing that needed improvement was the mozzarella-- it tasted rubbery and simply not fresh. But we'll talk dairy later. Heading back on the highway, the place we chose for our first encounter with Hawaiian waters was a beach protected by the National Parks Service. There we talked to a park ranger and I advocated for San Francisco's The Presidio, where I work at Crissy Field Center. They were impressed. Anyway, we head ed down to the harbor, parked, and walked to the beach. First we sighted an authentic Hawaiian hut and prayer structure. The water was the comfortable temperature of a swimming pool. My brother and I strolled the shore and discovered a couple of fish, including the Hawaiian state fish, Humuhumukununukuapua'a (or Humu for short). There were also some signs warning visitors of green sea turtles, which excited me, but I guess we'll spot them on another salt-and-pepper beach. Our last spot for the day was Costco, because we do how the locals do. I've heard rumors that Hawaiian Costcos serve beef bakes in addition to chicken and also sashimi to take home. The other thing people forgot to mention was the prices of certain things, including milk and eggs. I mean, five bucks a gallon? Honestly? Well, turns out there's only about 100 cows on this huge island, them being cattle and not dairy cows. So if there's one thing I learned from this massive warehouse, it's the realization of where our food comes from. Yes, people, Hawai'i is an island, and everything they don't make themselves-- like milk distributed from Seattle-- travels 4,000 miles over. That's remarkable. Consider ourselves lucky that happy cows come from California. 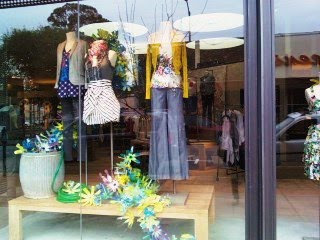 Today in Burlingame, a suburb about 20 miles south of the city, my mom and I stopped inside the store Anthropolgie. Now, we've always noticed how exciting their window displays are, even at separate locations. Today we were drawn to the flowers that wrapped around the mannequins--their curl of their petals were delicate and their colors were strong. 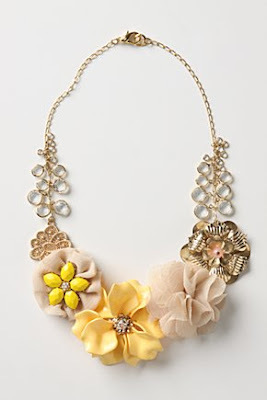 Even on an overcast day, it looked like spring! 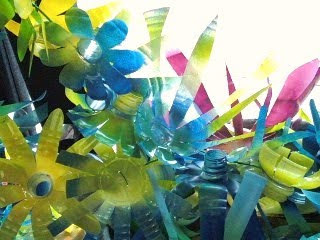 Upon closer inspection, we discovered that the flowers were actually made out of plastic water bottles, pried apart and spray painted. Genius! I should have asked who the artist was, because the sculptures were definitely impressive-- in beauty and eco-friendliness (except for aerosol spray paint, but yeah, yeah). I spent a good thirty minutes inside, and I swear I could just live in there. Not only am I talking about the urban style (the colorful patterns and contemporary cuts simply yell out, "Wear me in San Francisco!") but also the home decor. 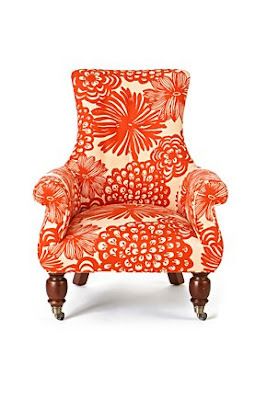 They have vintage mirrors, exquisite armchairs, poppin' bedspreads and the cutest tchotchkas. In fact, I picked up a cookbook titled Organic and Chic: Cakes, Cookies and Other Sweets That Taste as Good as They Look and jotted down a recipe for Sarah Magid's Easiest Chocolate Cake. Definitely going to try it! 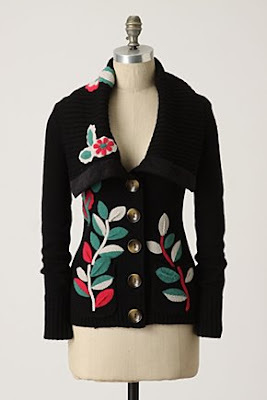 The perfect piece for winter to spring! Sigh. I'll be seeing those in my dreams tonight. 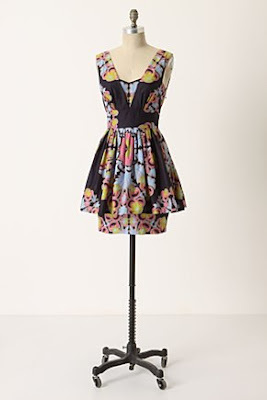 Oh well, I was satisfied "just browsing" in Anthropologie nonetheless. Okay, I know it's the new year, and this story is long overdue, but here goes. Over this winter break we finally had to time to watch the movie "Julie & Julia" on DVD. My mom and I were incredibly excited when it came out, but of course we never found the time to visit the theatre. John Clark, special to the San Francisco Chronicle, said "'Julie & Julia' is a beef Bourguignon of a movie" in a review back in August 2009. This statement striked attention to my foodie/Francophile grandparents. You see, my Pop's favorite French dish, or possibly his all-time favorite dish, is beouf Bourguignon. My entire family understands how dear this slow-cooked stew is to him. One time we dined at L'ardoise Bistro in the Castro in the fall together. The food was so good my Pop asked the darling waitress if they served his beloved beouf Bourguignon. She responded, "Oh, no, Monsieur, maybe only once or twice in the winter." That was understandable, and my Pop was willing to wait, he said. "Well, I know what I can do for you. I will call you when it's on our specials," the waitress said in her cute French accent. So we went back in the winter. The chef even came out and asked my Pop how he liked it. My Pop had to be honest, and he admitted that it wasn't as good as he's had in Paris. Maybe it was the fact that it was served on pasta noodles. Anyway, long story short-- Julia Child's beouf Bourguignon is known to be authentic and easy enough for the "Servantless American Cook". My aunt and her family visited during break, so we saw "Julie & Julia" together. The minute the credits rolled, we announced that we were making beouf Bourguignon pronto. Meaning tomorrow, for my Tita's birthday party. So we did. The key is selecting a good wine! The next day, the dish was nearly completed. All that was left was to simmer the meat and sauce, add a few finishing touches and serve. As it came closer to dinnertime, my Uncle Ben arrived, which was a big deal. You see, my Uncle Ben (who's really my great uncle) has been working as sous chef at the Nikko Hotel San Francisco for years. He's been around good food since he was cooking for the Army! On the contrary, he's stopped eating red meat. Of course, my mom invited him over anyway and told him, "Get ready to be impressed." Gulp. With that, he entered the kitchen and headed to the stove, the aroma hard to ignore. My mom's friend Cynthia was there, too, and the four of us looked at each other expectantly. Uncle Ben dipped in a spoon as he inspected the simmering stew. We stared as he brought the spoon to his lips. Uncle Ben closed his eyes and let the sauce linger on his taste buds for a moment. Then he spoke. "Boy, for awhile there I thought I was transported to Provence," he said. I watched as the three women erupted in a happy, girlish shriek. My Tita Maluh and I had passed the test. We served the stew to our party guests with rosemary fingerling potatoes and wine. Our plates were wiped clean with two different loafs of bread, one being a cheese slab from Noe Valley Bakery. Uncle Ben still couldn't get over how delectable our beouf Bourguignon was-- he was enjoying it without even touching the meat! Oh, and just to make your mouth water, we had a surplus of desserts-- one six-inch apple crumble cake from Lotta's Bakery, a variety of six gourmet cupcakes from Noe Valley Bakery, plus a simple Scharffen Berger mocha chocolate cake my aunt and I baked earlier "just because".